October is a very busy time at Zelda's store, everyone seems to be popping in to see Zelda and browse the wares in her Apothecary store. At the front of the store, below the shop signage is a double fronted window display of the latest colourful lotions and potions on sale. The lovely purple shop front door is lined with green foliage and seasonal pumpkins. When Zelda is not working in her shop she lives in the apartment above with her pet crows, Topaz and Ruby and her black cat Oscar. If we look inside the shop through the side window can you see witch Madelaine checking out the latest Witches Weekly volume? She thinks she has found an interesting spell, last week she accidently turned her guinea pig into a real pig and she is hoping this spell may help to turn him back again! So, let's go inside the shop and meet Zelda, she will be behind the counter under the shop lights, waiting for her next customer! There are so many lotions, potions and books, it's hard to know what to look for, but Zelda knows them all and can weight out anything you need on her measuring scales. A word of warning, when in the store, don't drink anything unless Zelda tells you its ok! 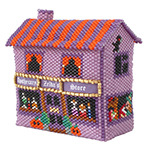 The 3D Apothecary Store has been designed to sit on a mantle piece as part of a Halloween village scene. Made using Round Peyote and Odd Count Peyote the building takes around 15 hours to bead. As usual with ThreadABead featured patterns we give full detailed photographic instructions and in this pattern there are 81 detailed steps, making this pattern even suitable for beginners to beading. Please note the pattern may not work with any other size and type of beads. There are 21 colours in total and the finished beadwork is approximately 6.75cm (w) x 3.75 (d) x 6.25 (h) cm. A short piece of gold thread such as 1 strand of embroidery thread or thick cotton is also required. Wadding is optional and a no tangle thread bobbin is useful. The bead pattern supplied is 25 pages and includes a full colour photo instructions and coloured pattern chart where needed.